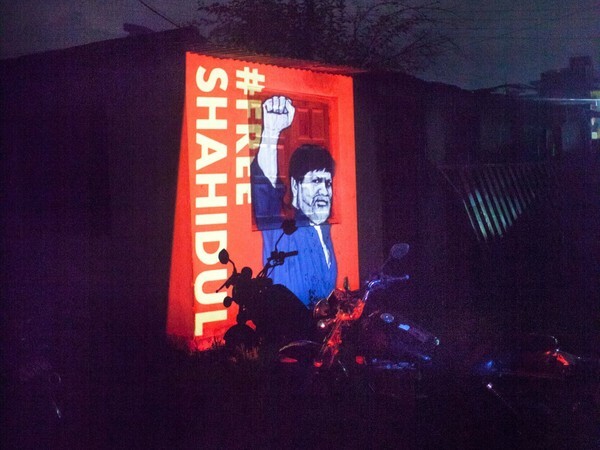 Activists in Kathmandu demand the release of Shahidul Alam as Southasian leaders, including Prime Minister Sheikh Hasina, arrive in the city for the BIMSTEC Summit. Dhaka. Sunday 5th of August. A little after 10:00 pm. I was staying the night at my mother’s apartment at Road no. 9A in the residential area of Dhanmondi. She was at the dining table having her dinner. I was in the drawing room next to it, heading for the room at the back. Suddenly a man’s scream – more a bellow, actually, of shock and fright! – tore through the night-time silence. Startled, I froze in my tracks. I had never heard anything close to it in the apartment complex. I turned to look at my mother, but she, elderly and hard of hearing, was carrying on with her meal undisturbed. I stood still in the dark, ears cocked. A madman’s howl of despair on the street? But no, it had come not from the ground level but somewhere closer to this fifth-floor flat. A ruckus in a neighbouring apartment? Very unlikely. I went to the window that had a direct view of the second building in the complex, of the fourth-floor apartment in which lived Rahnuma Ahmed, my sister and her partner Shahidul Alam. I saw, with a stab of surprise, two to three men on each flight of stairs from the fourth floor all the way down to the ground floor. Silhouettes in the sparse gloom going down fast. I looked at their flat. I could see into the small hallway of the entrance and a narrow slice of the sitting room. No sign of Rahnuma or Shahidul. Then I noticed that the front door was wide open. Not ajar, but gaping wide open. Just then two men came into view, walking swiftly from inside the apartment into the hallway and out of the door. In that glimpse under the lights, I registered their build, gait and short hair. Cops! They had that distinct look. But not ordinary ones. These were special plainclothes cops. Or worse, the feared paramilitary outfit. Alarmed, I noted that the other men on the stairs had that same look. One held, I saw now, a walkie-talkie in his hand. Why were there so many of them? What were they doing inside the apartment? Reconstructing the sequence of events later, I realise now that Shahidul had screamed when they seized him after he opened the door and manhandled him into the lift. With fear rising in me, I desperately scanned for Rahnuma, for the familiar figure in a sari. For Shahidul, in his trademark kurta pyjamas. Nothing. Nada. The total silence of the men was menacing. No chatting. No small talk. Menacing too was the way kept in formation: single file, middle of the stairs. By this time the last of the men were on the second-floor stairs. At this moment I experienced the brain freeze of extreme panic, where the mind refuses to believe the evidence of the eyes: This can’t be happening. The pointed gun, the knuckle whitening on the trigger, yet the disbelief: No, no, this isn’t happening to me. Standing at the window I thought frantically that there must be a perfectly good reason for these men. Maybe they had been called to another flat, and now were conducting a search of other apartments. But where were Rahnuma and Shahidul? Suddenly one figure stopped abruptly at the first-floor landing and looked directly up at the window. Reflexively, fear now coming in waves, I stepped back into the darkness of the drawing room. It was then that I heard the second scream. Again, it was more of a bellow; a guttural rise to it that was garrotted abruptly. This time it sounded like Shahidul’s voice; this time it was definitely from the ground level. The terror in the shout jerked me out of my trance. Something was seriously wrong. Now I know that then they were hustling him out of the lift into the waiting van, and he had struggled and screamed. I ran to the back room, and wrenched open the door to the balcony. From there, I looked down into a small patch of the car park area. I saw the front of a white van. Van! The van has acquired gruesome iconic status in all accounts and narratives of sudden disappearances and abductions from flats and apartments in the country in recent years. I again looked at their apartment. It had a desolate air, the front door still wide open, its occupants missing. Heads began to appear at the windows of the other flats, straining to look down into the car park. I ran to the dining table and grabbed the key to the front door, which was locked from the inside. My one thought was that Shahidul would be comforted by seeing me, that he wouldn’t feel crushingly alone. My mother looked at me in confusion. “Something’s going on at Rahnuma’s flat,” I blurted out to her. I slammed back the deadbolts on the door. But the key wouldn’t slide into the lock. I cursed the material world, the world of obdurate things and objects that remain deaf to human pleas! It went in. But wouldn’t turn. Then it did. I stabbed at the lift button. The damn thing was taking its own sweet time. Just as I turned to go down the stairs, the doors rattled open. I desperately thumbed the button for the ground floor. Hell, why was everything so slow? As soon as the lift doors opened I ran for the other building, going past the two guards huddled outside the guardroom, past the wide-open main gate. At the other end there was no van. In its place stood Saydia and Quamrul (of Drik, the photo archival institution founded by Shahidul Alam), looking shell-shocked. For long moments, we three stood, speechless, gazing at the open gate where dust motes kicked up by the van as it had gunned into the night squirmed in the neon light of street bulbs. “Men, they took Shahidul away.” Saydia could barely speak. This time they paid me no heed. Phones raised to their ears, they had switched into response mode. Dazed, my gut clenched, I stumbled back to the lift to my mother’s flat. Where was he? Who had taken him? It had been over in a sickening flash. The speed and ruthlessness of execution meant these guys were pros. But of what kind? I had no context for any sort of answer. I am not on Facebook; I am not pals with social media. And, absorbed in a personal project, I had kept up in only a general way with the street protests and demos by students demanding traffic order that had overwhelmed Dhaka. I had no clue about the al-Jazeera interview that Shahidul had given hours before, where in talking about the regime in power he had in effect stated that the emperor had no clothes. I didn’t know where to begin to think. In the lift going up, the word goom* kept banging in my head. Images of bloated corpses in scummy ponds floated before my eyes. Where those who disappeared tended to end up, amid the lotus flowers and water hyacinth. I tasted bitter bile in my mouth. My mother had an anxious expression on her face, aware now that something bad had happened at her daughter’s flat. I sat down in the very chair Shahidul Alam had occupied last evening. He had come over, clad in t shirt and an épater le bourgeois tie-dye lungi, to see her. I told her, watching horror dawn on her face as she began to comprehend what had happened, her mouth frozen in the ‘O’ of Opohoron* that she could not quite bring herself to say out loud. The hours until we learnt reliably that he was alive, in detention, were unspeakable. *Goom and Opohoron are Bengali terms for disappearance and abduction, and are now used commonly in political discourse in Bangladesh. ~Khademul Islam is a writer and editor of the Bangladeshi literary journal Bengal Lights.